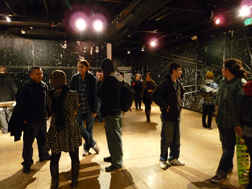 Video documentation of different visitors to the Sheppard Fine Arts Gallery, at the University of Nevada, Reno, interacting with an artwork entitled "In Concert," as part of Jeremy Stern's MFA thesis exhibition, "Following," on view March 7 - 11, 2011. This exhibition explored the reconciliation of personal experience with mapped information by using the gallery's own systems (cameras, 4-channel ceiling-mounted speakers, ceramic tile floor, hidden door, and lights) to transform the place of the gallery into an impression of the space of Reno/Sparks through a sampling and live mixing of site-specific sounds. "In Concert" utilized two systems to measure visitor movement through the entire gallery space and play back sounds of the larger Reno/Sparks environment in which the gallery also sits. One system, co-developed with Steve Struebing of www.polymythic.com, used 3 PIR sensors per device to trigger changes in environmental sounds through an Arduino controlled mp3 player. Two devices were active in this system: one that controlled water flow of the Truckee River where normally loud sound diminished with increased movement along the sensors' range; and another that increased the normally diminished sounds of auto traffic with increased movement along the sensors. 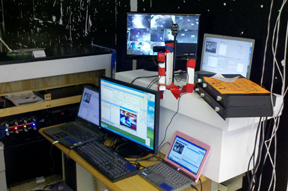 The second system, Eyecon, used 4 computers, each with a webcam pointed at the gallery's 8-channel security monitor, whose cameras were angled at the grid of the gallery's ceramic tile floor. 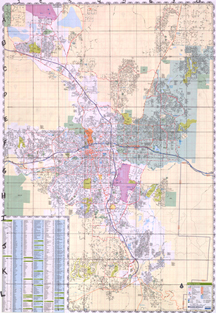 The 8 x 12 square grid was transposed onto a Rand McNally road map of Reno/Sparks, and site specific sounds were gathered from locations on that map, within that grid. Using Eyecon, these site-specific recordings were programmed to drop down over top of anyone entering the view of the security cameras through the gallery's 4-channel, 8-speaker sound system. The result was that visitors walking across the gallery became literal giants in the Reno/Sparks landscape, and based on how slow or fast they moved through a tile/mapped space, one might hear a brief clip or a lengthy environmental recording identifying that abstract sound as a specific location. This work was made collaboratively with Anthony Alston, Greg Brettell, Joseph DeLappe and the Digital Media Department of UNR, Greg Gardella, Shelly Goodin, Audrey Love, Jean-Paul Perrotte, Clint Sleeper and Frieder Weiss.